Every year on the first Saturday in September many people in the U.S. are relaxing, enjoying picnics, and celebrating the final days of summer. But we here at WRSPA are thinking about how many ways we can geek out on vultures without causing alarm to our friends and family. We are lucky in Pennsylvania to have these two species of vultures grace our skies, the turkey vulture being the more common of the two. The wingspan of these large majestic birds can reach up to six feet, making it easy to spot them riding the thermals and circling above us in the air. They are not always scoping out a meal when they’re up there–most of the time they are literally just hanging out, as riding the columns of rising warm air conserves considerable energy (no flapping!). Let’s not bury the lead here–vultures eat dead stuff and don’t get sick, they use their vomit as a defense mechanism, and they pee on their legs...WHY DOESN’T EVERYONE LOVE THESE GUYS? Well, there may be a few reasons why these often-misunderstood birds get a bad rap, but we can help clear the air and have everyone jump on the vulture-appreciation train. Firstly, people are sometimes put off a bit by the eating habits of a vulture. Sure, there are loads of species that make a habit of munching on carrion (fancy science word for dead animals), but vultures seem bear the brunt of public disgust for doing so. People mistakenly think they are gross, unclean, and that they are pests that will destroy property or nab the family pet from the backyard. As we'll find out, vultures certainly are not gross, and don’t often take live prey, and, if they do, the animal was likely weak or compromised (think newborn or sick animals), as they lack the grip strength in their feet for killing prey like true raptors. 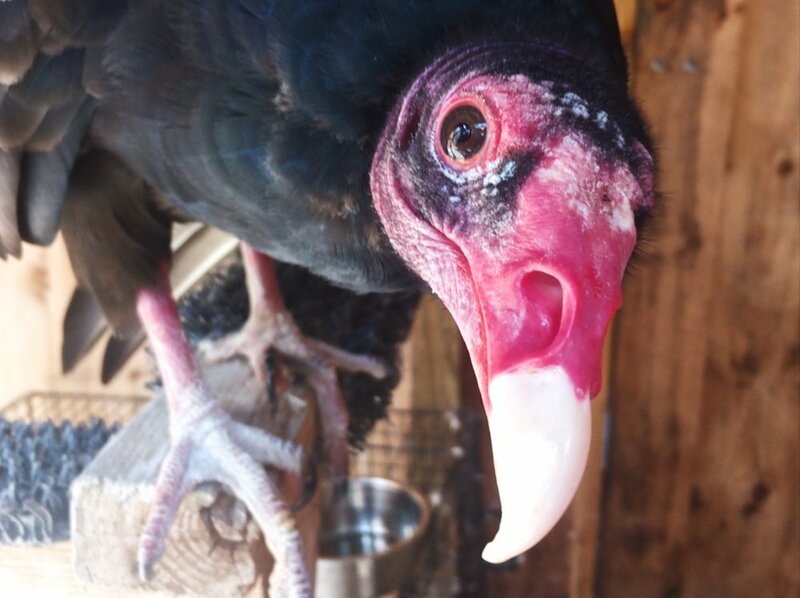 Interestingly, turkey vultures have an excellent sense of smell that sets them apart from most other birds, including other vultures. A turkey vulture can smell the gas released from a rotting carcass–ethyl mercaptan–from pretty far away, allowing them to find food not only by sight but by smell (great for discovering lunch from the air that might be hidden by the forest canopy). Black vultures cannot detect this scent so in areas where both species are present, black vultures, the opportunistic and aggressive buggers that they are, will follow turkey vultures to the carcass and often push them out of the way. Their iron acidic stomachs are a marvel of nature! Those 528 different kinds of bacteria that were transferred from the dead animal to the vulture’s face? Scientists found only 76 types of bacteria in the vulture’s gut– this is some major bacterial destruction going on inside the highly-acidic stomach of the vulture! The fact that they are able to tackle some of the most harmful bacteria, such as botulism, makes them a very useful species to study. My favorite vulture adaptation is where the title of this post comes from...the practice of urohidrosis (the fancy science word for basically peeing on themselves). This serves two functions, one being that it is a cooling mechanism for them. So, while we humans sweat when we’re hot, vultures are cooled by the evaporation after relieving themselves on their legs and feet. I mean, I complain about sweating in the summer, but I’ll take that over the vulture’s technique any day! The acidity of their urine also kills the bacteria their legs and feet come into contact with, protecting them from possible infections and from spreading the bacteria around. "I HATE TO EAT AND RUN BUT..."
Occasionally vultures have to. If they have to make a quick getaway to escape danger the vulture, who isn’t the most adept at a quick lift-off, must find a way to “lighten their load” quickly. This means they will vomit up whatever is in their stomach. They also do this to protect their ground nest area from a possible intruder. If you know how bad a rotting carcass smells, you can probably imagine that the unsavory-ness increases tenfold once it’s regurgitated. I’ve smelled it a lot and it’s definitely one for the books. See? These super scavengers are amazing creatures, and they play such an important role in our ecosystem. They are often referred to as “nature’s garbage men”, as they help to rid the environment of rotting flesh and this inhibits the spread of disease. What would our lives be like without vultures? I certainly don’t want to find out! We’re lucky in Pennsylvania to have a robust vulture population, but many species throughout the world are in decline. Please check out www.vultureday.org for more information on how you can help. Wildlife rehabilitators in Pennsylvania provide care for orphaned, sick, or injured vultures every year. These animals require much care to feed, house, and rehabilitate them properly for release into the wild. Please consider donating–your financial help can go a long way to provide for these amazing creatures. 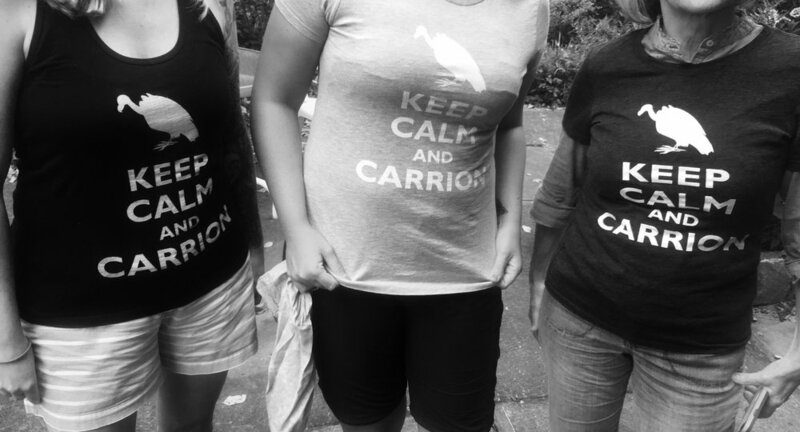 And don’t forget to KEEP CALM and CARRION– and share the vulture love!